An important part in the revitalization of downtown, Renaissance Allentown Hotel provides an ideal destination in a historic setting. Once a bank building, our property provides luxurious spaces and contemporary amenities. 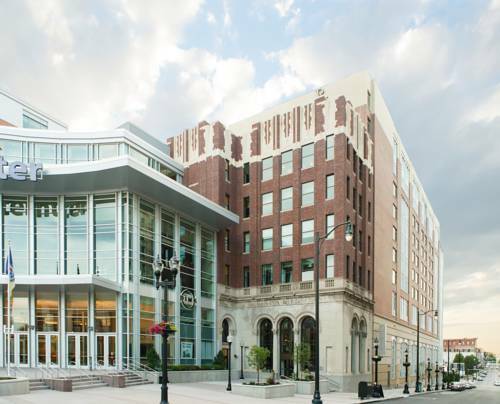 Elevate any experience at our hotel when you take advantage of our connection to PPL Center, hosting concerts and hockey competitions throughout the year. It's also easy to explore art galleries surrounding us and top off your day at our full-service restaurant, The Dime, serving locally sourced fare in an upscale atmosphere. Great for groups, we are home to 17,932 square feet of flexible event venues, complemented by outstanding audiovisual services and an expert culinary team. From corporate trainings to wedding celebrations, we have the space to enhance your event in Allentown. After a rewarding day, return to luxury rooms with plush bedding, free high-speed Wi-Fi, city views and 24-hour room service options. Start planning a successful stay at Renaissance Allentown Hotel. The Dime: The Dime is an upscale dining experience in downtown Allentown. Our restaurant's menu features locally inspired and sourced Pennsylvanian American cuisine. Our inspiration comes not just from our own Lehigh Valley, but from all regions of the state.